Client wanted a separate entertainment /outdoor dining area near an existing deck on the side of the house. It needed to create privacy from the neighbours, and incorporate food planting and garden space where possible, together with seating areas and a wood-fired pizza oven. Artistic elements were emphasised as being important, especially the use of colour. Power and lighting was also requested. A functional, private space was created that had strong artistic elements. 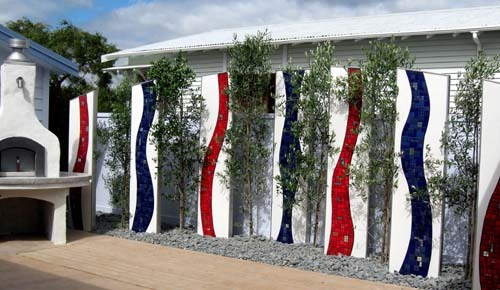 Tall panels featuring abstract mosaic art were designed, built and installed then intersperced with mature olive tree plantings to provide an artistic focal point as well as privacy from the neighbours. The exisiting deck was altered to incorporate seating and gardening space around its perimeter, and lighting and power was installed. The result was a stunning, very unique design that the clients were very happy with - their first hosting was for the local neighbourhood where they cooked 50 pizzas straight!